When it comes to antennas it has always surprised me how much can be accomplished with very little. My very first antenna in 1972 was a 20m dipole running from the edge of the roof to the top of a clothesline post. The average height was no better than 4 meters. With that and an 807 I worked the world. 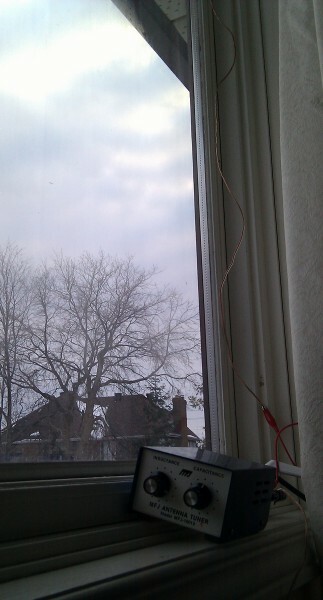 The eaves trough antenna (mentioned yesterday, and feed point shown in the adjacent picture) is at least as good, and it's up higher: 6 meters. Of course it also helps that I'm no longer in the radio black-hole that is VE4-land. The antenna farm I took down in 1992 consisted of a 19-meter tower sporting a TH6DXX for high bands, long-boom yagis for 6m and 2m stacked above it, a 2-element 40m inverted-vee wire yagi and a half-sloper for 80m. Toss in a 30S1 and I was competitive in any pile-up (and I could generate a few myself). My plans for 2013 are substantially more modest since this time it's for fun, not to be competitive. As I got down to planning last month I made a list of the primary objectives my next antennas would have to meet. No tower: In fact, no new permanent structures of any kind, whether stand-alone or attached to the house. I will make do with what I have or with new, non-permanent supports. The trees are not suitable as antenna supports but I do have other uses for them. I do intend to make use of my house's height, which is just over 8 meters above local grade. 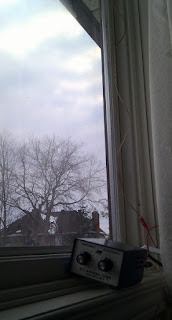 No rotator: Antenna will have to be fixed and at best electrically steered. This means there must be an emphasis on omnidirectional antennas. DX performance: DX requires low-angle radiation. Considering the heights I have to work with there will have to be some bias towards vertical polarization. QRP friendly: With little power coming out of the transmitter there is little tolerance for loss in the transmission line, matching networks and antennas. While I don't think I'll need to bring the Heliax out of storage, loss will need careful attention. Minimum impact on aesthetics: Putting antennas in my back yard is best but there is no way around visible impact if I use the house roof. This means the antennas will be visible and I'll have to do my best to not make them the centre of the neighbourhood's attention. Survival: Wind, ice, sun and temperature gradients are all concerns. Non-permanent structures and antennas can be made robust and worry-free, just as permanent structures (as I and many others will attest) can be fragile as a result of poor design and unjustified optimism. I did not list low cost since that is not an objective. However if I can make it inexpensive that's certainly a positive outcome. I have been designing supports and antennas during the past several weeks. I upgraded my ancient version of EZNEC from W7EL (actually EZNEC+) and put it to work on my quad-core desktop. Ideas are gelling into solid plans. I'll talk more about these antenna designs in future posts. Right now I'm being distracted by the background sound of an unruly pile-up on XT2TT. This one may be out of reach until my antenna plans come to fruition in the coming months. Spring is in the air.